The fight over the Ocean Beach home is not over. SAN DIEGO (KGTV) - Just in time for her 99th birthday, a woman on the brink of losing her Ocean Beach home won a legal victory to stop her eviction. 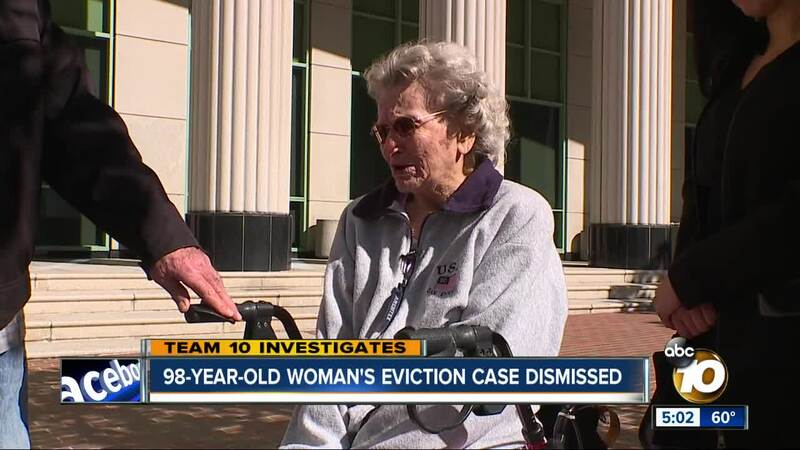 On Monday, attorneys agreed to dismiss an eviction lawsuit against 98-year-old Betty Morse. "They didn't cross their T's and dot their I's the way they are supposed to, so I brought that up to them in a formal brief,” said Betty’s Attorney Andrew Griffin. “So they capitulated and said ok we're going to dismiss the case and start all over again." The victory may be short-lived. Griffin says there’s nothing to stop the landlord from starting the eviction process again. “Legally she gets to stay there until they start again and do the paperwork correctly,” he said. Last year Morse received a 90-day notice terminating her tenancy. According to the termination notice she showed to 10News, the owner is electing to opt out of the Section 8 program and not renew the lease. It states the owner will be conducting substantial renovations to the unit and following the renovations the owner desires to rent the unit at a higher rental value, being that of the market rate value. The notice states the owner will be opting out of Section 8 entirely. 10News discovered there's nothing illegal about opting out of Section 8. “They are saying it’s been this time, I’ve remodeled all the other properties and now I want to remodel yours, and I can’t remodel it while you’re here,” Griffin said. After the hearing, the landlord told 10News she had no comment. She also would not say whether she planned to start the eviction process again. Betty Morse says she thinks Monday’s hearing was terrific and remains hopeful she’ll get to stay in her home. “I’m going to try really hard to hang in there,” Morse said.